The other day, my team at work had a catch-up at The Tea Salon in Emporium. I purposely didn't bring my wallet so I wouldn't be tempted to indulge in scones. But then I watched my team eat scones, and couldn't stop thinking about scones all day. 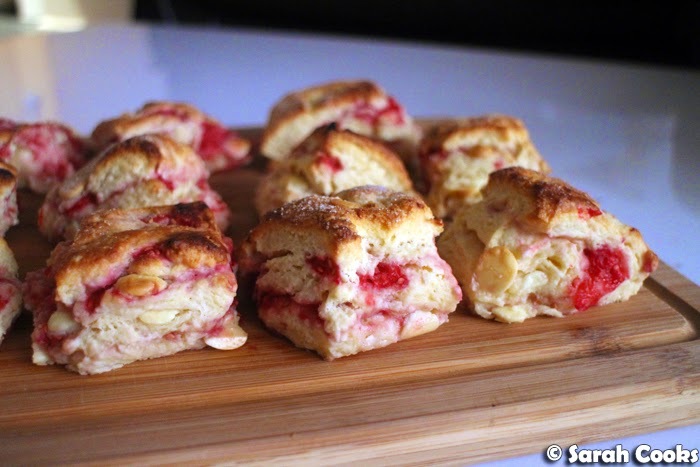 So, when I got home that evening, I whipped up a batch of raspberry and white chocolate scones. Then I spent all week eating the scones. Scones scones scones. Oops. So, these are more of an American-style scone than the ones I normally make. Being full of tart juicy raspberries and buttery rich white chocolate, they're great on their own, with no need for cream or jam. (Although I snuck a little butter onto mine - yum). I chose to make raspberry and white chocolate because it is one of my favourite flavour combos, and I happened to have two punnets of awesome raspberries in the fridge. 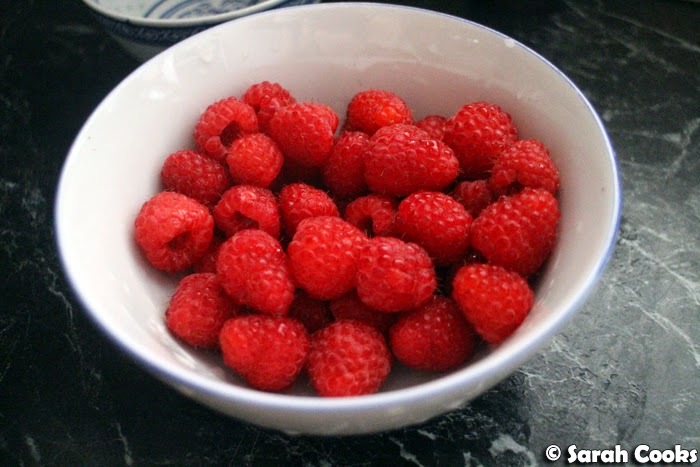 I totally love raspberries, and am so happy that they're abundant (and reasonably cheap) right now! 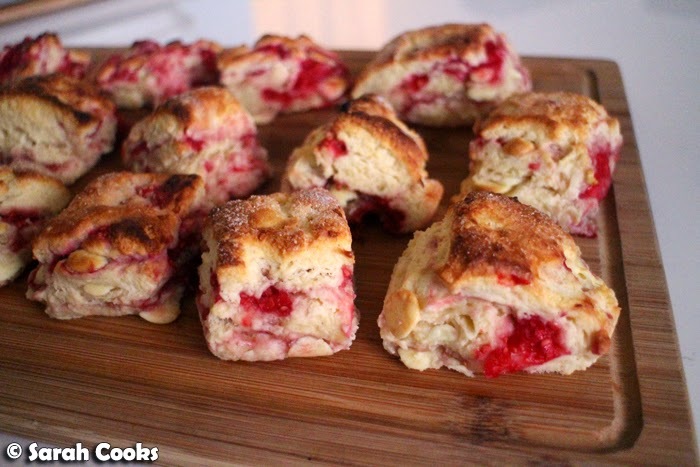 I adapted this recipe from Martha Stewart's recipe for Fast Raspberry Scones, with the main changes being that I added white chocolate chips, and that I made the dough by hand rather than using mechanical assistance. (I often find that dragging out the food processor - and then cleaning it, ugh - is more hard work than just getting stuck in with my hands, especially if I'm not working with big quantities). The dough for these scones is a standard one - rub butter into dry ingredients, then pour in liquid ingredients and stir to a form a dough. In this case, tangy buttermilk for a tender dough and an egg yolk for extra richness. Boom. 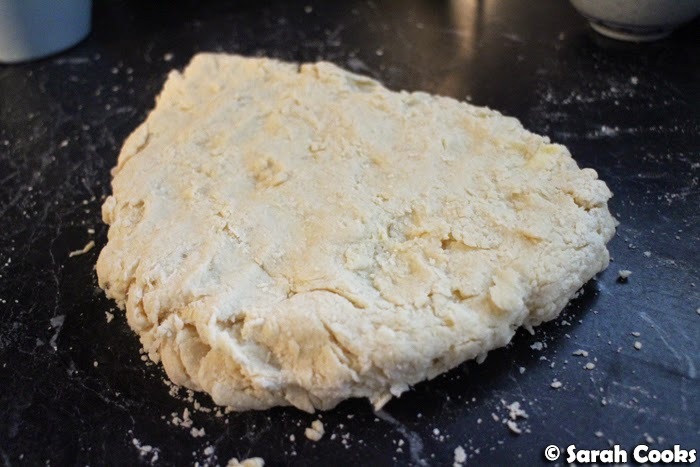 After you've added the liquid ingredients, the dough is quite shaggy, but don't be tempted to add more liquid. 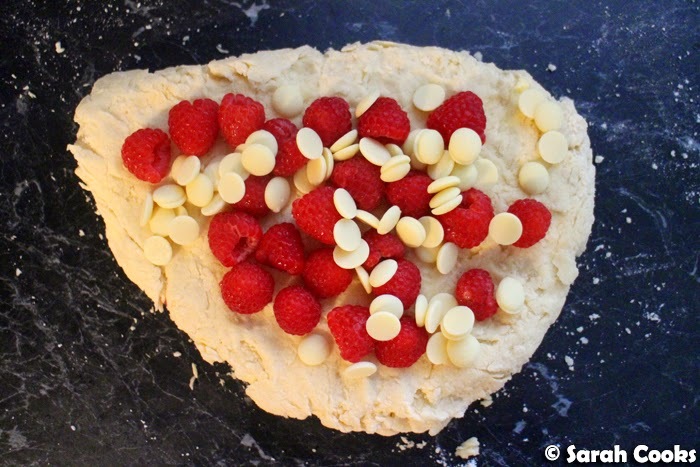 The dough comes together as you press it out, and it gets extra moisture from the raspberries. 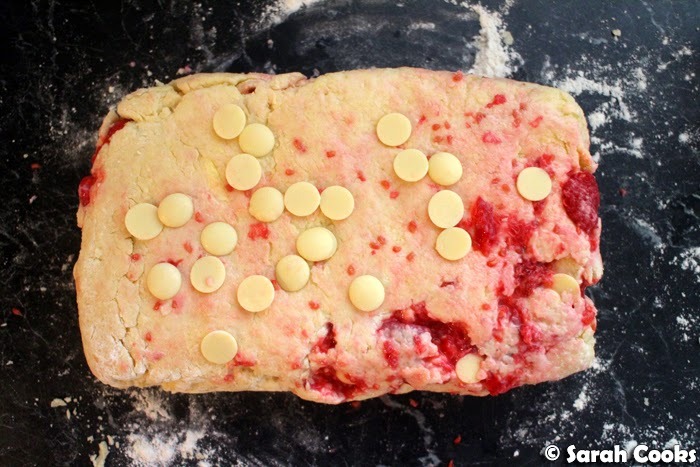 I found the easiest way to incorporate the white chocolate chips and fragile raspberries was to scatter half of them on top of the dough, fold the dough in half and then gently press it out, then repeat. This stopped the dough from being overworked (important when making scones! ), and prevents the raspberries from getting too squished. I used fresh raspberries this time, but frozen raspberries would work too. Come to think of it, frozen raspberries might be even better, as they wouldn't squish as much. As you can see, I got a couple of super moist areas on the dough from the squashed raspberries, which were messy and a little tricky to slice (but still delicious). I was sooooo pleased with these scones - fluffy middles, crunchy top (best), loads of juicy raspberries and sweet, sweet white chocolate chips. These were fantastic fresh out of the oven, but they also kept quite well. I put leftovers in an airtight container and kept going back to them over the next four days for snacks and breakfasts. They didn't dry out too much and were still nice at room temperature, but even better microwaved with a little butter. 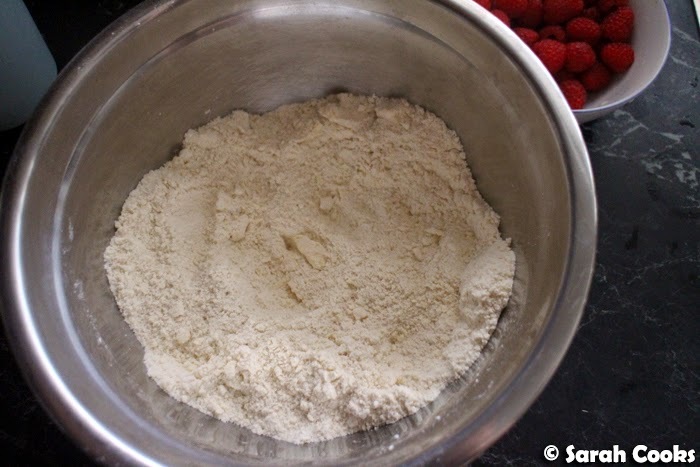 Place flour, 1/4 cup sugar, baking powder and salt in a large mixing bowl and whisk to combine. Rub the butter into the dry ingredients using your fingertips, until the butter is evenly distributed and the mixture resembles coarse breadcrumbs. Whisk together the buttermilk and egg yolk. Pour into the dry ingredients and stir gently until just combined. Tip out onto a lightly floured surface and press out into a large rectangle. 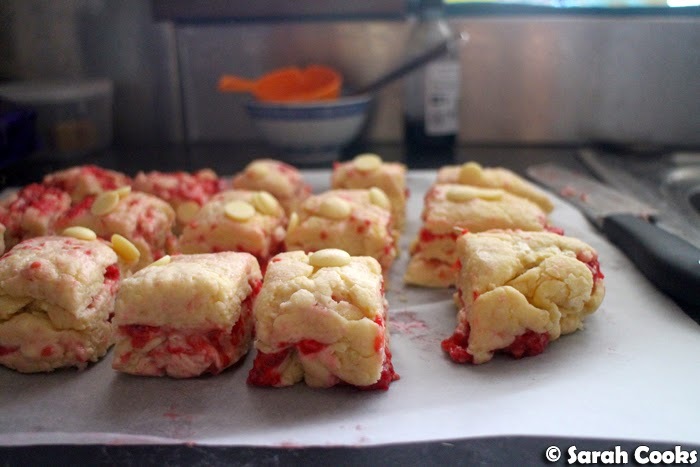 Scatter half the raspberries and chocolate chips over, then fold in half and gently press out into a large rectangle. Top with the remaining raspberries and chocolate chips, fold in half again and gently press out into a rectangle approximately 4 cm thick. Cut into roughly evenly sized squares and place on a lined baking tray. Sprinkle over the extra tablespoon of sugar. Bake for 15-20 minutes, rotating halfway through baking, until golden brown and cooked through. Allow to cool slightly, then eat. Makes 15 scones, depending on how big you cut them. With everyone talking motor racing or cricket around here today, I think I should head to the kitchen and make these gorgeous scones!